Once in a while, your dog may have problem pooping. He may be straining and may even show some pain. Sometimes he may only have a "small production", other times he may not be able to produce anything at all even after trying for a while. There are numerous possible reasons why a dog is constipated, some are serious and require prompt veterinary attention. If your dog is constipated and cannot go to the bathroom for over two days, you need to take the dog to the veterinarian for a check-up to rule out any underlying health problem. But what can you give a dog to help with the occasional mild constipation? 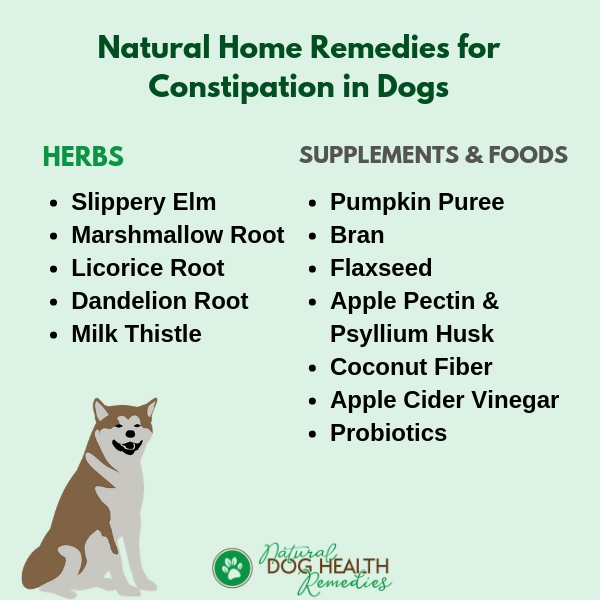 Read on to find out some simple home remedies such as herbs, foods, and natural supplements that can safely be used to "unconstipate" a dog. Canned Pumpkin: Pumpkin is one of nature's great superfoods. It contains lots of dietary fiber and is also rich in antioxidants, vitamins A, C, and E. If your dog is having problem relieving himself, feed him a tablespoon or two of canned pumpkin for a few days until he can have regular bowel movements again. Bran: Bran also gives your dog extra dietary fiber. Add half a teaspoon to one teaspoon of bran to your dog's food. Flaxseed: Flaxseed can lubricate the intestines and facilitate bowel movements. You can add 1/4 to 1 teaspoon of ground flaxseed to your dog's food. Apple Pectin and Psyllium Husk: These 2 substances are both high in fiber and are good for constipation. Apple pectin also has antioxidant properties. Combine equal parts of powdered apple pectin and psyllium husk. Add 1/4 teaspoon mixed powder per 10 pounds of body weight to water - just enough to soak it well. The mixed powder will expand and the liquid will thicken. Add the thickened liquid to the dog's food once or twice per day. Coconut Fiber: Coconut has a lot of health benefits for dogs. Coconut fiber is effective in facilitating bowel movements. You can give 1 teaspoon of coconut fiber per 10 pounds of body weight, one or twice a day with food. Apple Cider Vinegar: ACV also has a lot health benefits for dogs, including, among other things, helping with digestion and relieving constipation. You can give 1/4 teaspoon per 10 pounds of body weight, one or twice a day with food. Probiotics: Probiotics, which contains "friendly bacteria", are essential in re-establishing the normal GI flora in your dog's digestive system. An imbalanced GI flora can sometimes lead to digestive problems such as constipation, gas, or diarrhea. Clean Water: Last but not least, make sure that your constipated dog has access to clean water all the time. Just like people, dogs need to drink enough water to stay "regular". If your dog doesn't want to drink water, try adding a bit of low-sodium chicken broth to the water to add a bit of flavor. This may entice the dog to drink more. 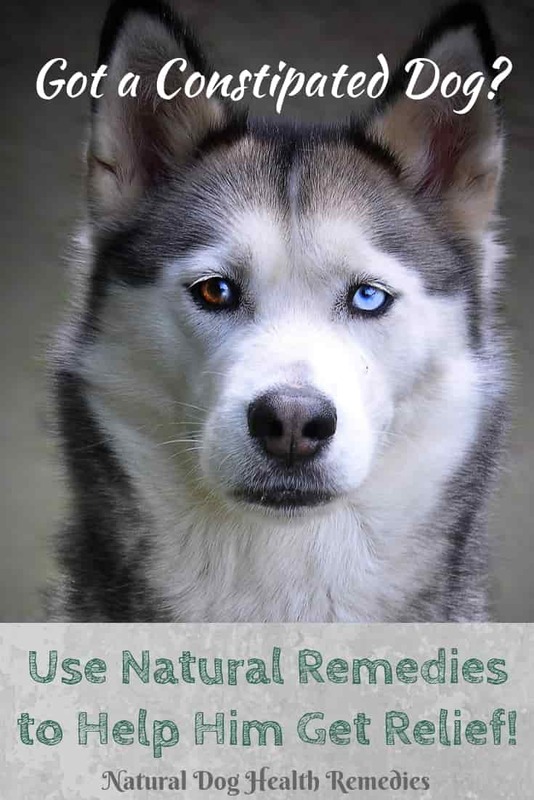 If your dog has chronic constipation, try using herbal remedies. Herbs are found to be very effective in relieving chronic constipation in dogs. Slippery Elm: Slippery Elm is the best herb for treating constipation or diarrhea. (Yes - it is that versatile!) It is a soothing nutritive herb that coats and soothes the digestive tract and intestinal walls. This herb also provides mucilage that can reduce irritation of intestinal tissues, and help maintain regular elimination patterns. Marshmallow Root: Marshmallow root has properties similar to those of slippery elm and is useful for soothing, coating and lubricating the intestinal mucous membrances. Licorice Root: Licorice has anti-inflammatory properties and is also an adaptogen, which means it can bring the entire body into balance and promote well-being. Dandelion Root: Dandelion is a general stimulant for the liver and urinary system. It helps to detoxify the body and is rich in vitamins A, C, E, and B complex, as well as useful chemicals such as potassium, calcium and iron. Use this herb as a dietary supplement to boost your dog's liver condition and sluggish digestive system. Milk Thistle: Like dandelion, milk thistle also detoxifies the body and strengthens the liver. It is advisable to feed the herbal supplement on an "on-off" basis: for example, feed it to your dog for 2 to 3 weeks, stop for one week, and repeat as necessary. Mineral Oil: Some people suggest giving mineral oil to a constipated dog. Don't! Not only is it not effective, it can also cause a lot of damage to your dog if he accidentally inhales the oil into his lungs. Laxatives for People: Although some laxatives for people are safe for use in dogs, others are not. To be safe, check first with your vet. 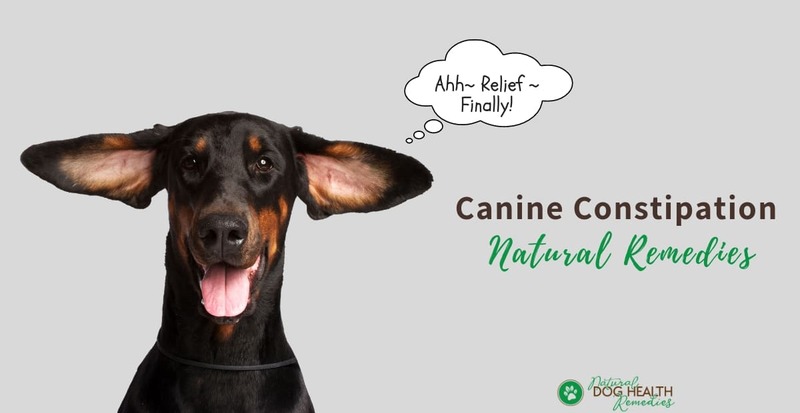 These natural products are effective in helping dogs who suffer from constipation. They are good to have in your dog's first-aid kit! This herbal tincture can be used as a mild laxative for overnight relief of constipation. It contains herbs such as licorice, ginger root, oregon grape, and turkey rhubarb root - all effective herbs for treating constipation by stimulating the muscles in the digestive tract without causing discomfort. Chronic constipation indicates a weak digestive system. Use this natural remedy to support the GI system of your dog. It contains probiotics, vitamins, herbs (e.g. slippery elm, licorice, alfalfa), micronutrients and enzymes, and is very effective for dogs suffering from chronic or recurrent poor digestion, food allergies, or irritable bowel issues. This formula contains organic herbs that enables normal, easy elimination through the bowels. It is safe and does not irritate the GI system. It also prevents flatulence! Check this page for some common causes of Dog Constipation.